Rate this Article With the advances being made in Virtual Reality especially in video game development, let’s take a look on how VR will affect and change the way we play our games in the future. Today’s advances in Virtual Reality have currently made it so popular that it is common to hear and read about speculations that VR will be the future of gaming. Of course the VR purist or those who tend to gain the most from it will argue that it is. However, from a practical point of view, it would be safe to say that VR will influence greatly the gaming industry both current and future though, it is not solely the future of gaming. Virtual reality has opened a doorway so to speak into what the future of digital or computer gaming will be. The keyword is immersion. Full-Total-Focus. The core intent of VR is to temporarily remove you from your current reality (your physical real-life surroundings) and move you to a virtual reality, be it a game, a conference, a simulation or whatever the VR program is suppose to represent. These is done with the use of an ocular headset, a Hi-Fi (high-fidelity) audio headset, data gloves, data suit or whatever combination of contraptions you stick to yourself and connect to the computer or VR box that will simulate you being in that VR world. "So, does it work Mr. Data? I believe so Capt., crude, but workable. I believe the Holo-deck is programmed and running Sir. Early 21st Century and you won’t get dizzy looking around it. Very well Mr. Data, carry on. Why don’t we take a look?" As for VR, let’s look at some of the reasons how it currently affects computer gaming and how these contribute to the future of gaming. Though considered crude by Mr. Data, let us remember that we are at the doorway and not even stepping inside yet the so called future “Digital Immersive Virtual Gaming”. We don’t even have sockets at the back of our necks to jack directly into the digital matrix like Keanu Reeves. Neuromancer last I checked is still “The” novel by William Gibson and I am still using a regular PC keyboard going tac tac tac to write this. But guess what, this is exactly where VR is right now; the same exact place in time when PC first started to take off. VR makes possible things that are not currently possible in real life. It takes you into a simulation where you can experience things that happen that feel so real yet you’re still standing there in one piece. It takes you to that place using your perception while keeping your body in a room (hopefully in a harness) and let’s you experience what it’s like to fall to the ground from 300 ft and still be alive and looking stupid afterwards. VR affects you at an emotional level that isn’t possible using an ordinary monitor screen. You are in the gaming world itself. You look around and you see everything in 360 degrees. You interact with the environment directly based on what and how you perceive it to be. When you fall, you will feel the terror as you feel that you are really falling. Lucky for you, it's not real life; it’s just VR. Multi-player VR can foster social cooperation between players where teamwork and camaraderie will play an important role in attaining objectives. 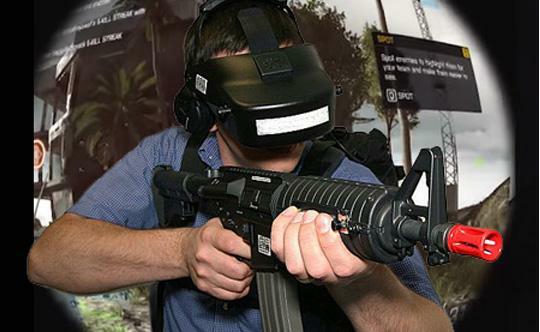 The players or team can all be in the virtual environment at the same time like in a co-op VR FPS match. Another example would be asynchronous gaming where team members are not always in exactly the same VR environment. One may be in a virtual control center supporting the others who are on field and actual line of fire. The player at the control center gives info and guides the others making it easier for them to complete the mission. Of course, VR is not without its current disadvantages. The bulky hardware and equipment, the unstable optical and sensory simulation that will make you dizzy, disoriented and nauseatingly want to throw up and the price that currently makes it difficult for the average Joe to obtain and own the best way to experience VR at the highest possible quality level. One disadvantage worth mentioning is that the current VR equipment we have today cannot really fully interface our real life body with the virtual world. When you perceive an out of control speeding sports car coming at you, your body reacts and you literally jump to avoid it. Even with a harness, the tendency to hurt your self is ever present. This has to be addressed in future VR equipment and inter-active software design. Based on these current observations, we can somewhat form a picture of how game developers and equipment designers can work to improve on what they’ve currently got to what they should have based on the lessons learned from today’s VR gaming efforts. Video games of the future must give the player the most possible realistic location effect. They must give a form of total immersion and retain it for long periods of time. A player can go into a virtual world as if stepping into another room in real life and step out again hours later without feeling sick or possibly having a seizure from optical side effects. Video games will give the player the most possible emotional and sensory effect. One can touch, feel, interact and even smell the virtual environment in it. Real life events that can make you laugh, cry or shout in terror are already being experienced with today’s VR technology. The Zombie may not be real (yet) but the terror is as real as it gets. With continual future development, the skies' the limit when it comes to how far VR games will go. Due to its immense success on other gaming platforms, multiplayer will definitely be a priority. Team based games, VR or otherwise will continue to evolve and grow. E-Sports is continually on the rise and the application of Virtual and Augmented reality in competitive game play provides an exciting scenario on how games will look like in the future. "Capt., the history of this…err Holo-deck is extremely fascinating. " "Yes Mr. Data. Apparently they where trying to make better games. If they only knew their efforts would end up here…on the Enterprise." And they both exited the deck.